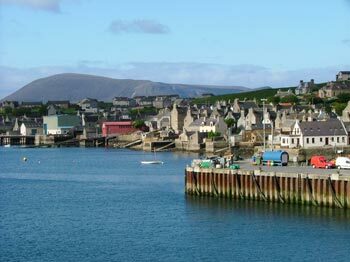 The Orkney islands are and archipelago of some 70 islands located off the north of Scotland of which only 21 are inhabited. With quiet sandy beaches and stunning scenery Orkney is ideal for those looking to slow down a bit from their normal busy lifestyles, but there is also plenty to see and do in Orkney. Kirkwall and Stromness provide an excellent range of shops, restaurants, museums, visitor centres, galleries and a leisure centre. The Pickaquoy Centre is Orkney's largest community and leisure centre hosting various events as well as providing all the normal facilities that one would expect at a leisure centre, such as fitness suites, swimming pool and various outdoor sports facilities. The Pickaquoy Centre is also the home of the Phoenix Cinema. Visit the Pickaquoy Centre website for full details of their facilities and cinema/event listings. The Pier Arts Centre which is a focal point for the local artist community and hosts a year round programme of changing exhibits, visit their website for more information. Only four stones remain of the Standing Stones o'Stenness, the largest of these standing some six metres high. The stones stand by the south eastern shore of the Loch o'Stenness, next to the road that leads to the Ring of Brodgar. 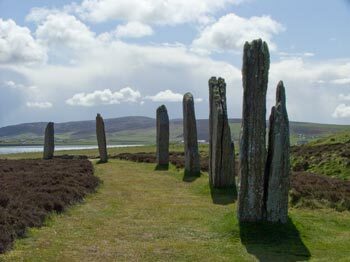 The Ring of Brodgar dates back to 2500 - 2000 BC, the stone ring forms a circle 104 metres in diameter. It is thought to have originally contained 60 stones but today only 27 stones remain.